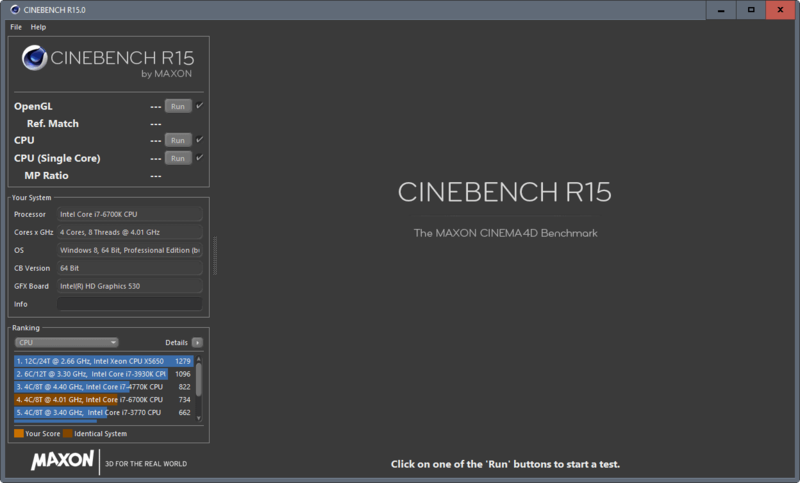 Maxon Cinebench is a free benchmark software for Windows and Mac devices by Maxon, a company best known for the 3D graphics package Cinema 4D. Benchmarks can be useful in determining the performance of hardware components or a computer system. Useful to find out how fast a component or the computer really is, in picking the right component for a job, or for comparing the performance of a component over time. Benchmarks that don't offer comparison are mostly useful if you have different components at your disposal that you can compare against each other. Cinebench is available for PC and Mac. We have downloaded the latest version for PC from the developer website, and used it exclusively for the review. Note: The program requires a 64-bit operating system. It won't run on 32-bit versions of Windows. The benchmark software has a size of about 80 Megabytes for Windows. It is portable, so that you can run it right after you have downloaded the package and extracted it on your device. You may save it to a removable storage device, so that you can carry it around with you to run tests on devices you use without having to install it. The program displays two benchmarks at the top left corner: cpu and gpu. Below that is information on the system the program is executed on, and the ranking. The application did not identify the operating system correctly. It listed Windows 8 as the operating system, but the system the software was run on was running Windows 10. The benchmarks run fast and highlight a score right afterwards.Cinebench checks the components for compatibility before running any tests. The OpenGL benchmark that tests the graphics processor unit shows render sequences, the cpu benchmark a render test of an image. Most interesting from a user's point of view is probably the ranking. The tested component is added to the ranking table which lists processors and video cards that are slower and faster than the ones installed on the machine the test was run on. The ranking is limited to eight processes and video cards however, of which one is the device's cpu or card. There is no option unfortunately to load the full list of tested processors or video cards, but the comparison is better than not having any form of comparison at all. Hidden under the File menu is an option to enable the advanced benchmark functionality. It adds another test -- cpu single core -- to Cinebench which you can run as well. It tests just a single core opposed to all cores of the processor. The file menu lists a handy "run all tests" options on top of that. 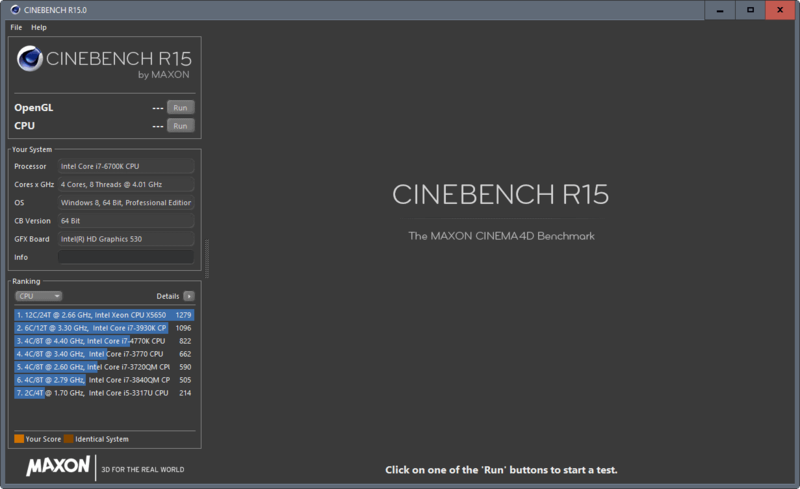 Maxon Cinebench is a handy benchmarking software for 64-bit Windows and Mac devices that runs well, and provides you with information on how well the cpu or gpu did during the test. The ranking is somewhat limited however, and it would definitely be more useful if Cinebench would provide an option to list all tested components, and not just a selection. Now You: Do you run benchmarks? If so, why and which? The app doesn’t really give a summary as in where your PC stands; just comparison and rankings, which i believe isn’t sufficient to grasp what the numbers mean. Userbenchmark is pretty good, but not quite 100% accurate.